Converts Large Size PST files to MBOX file for Thunderbird, Apple for Mac. 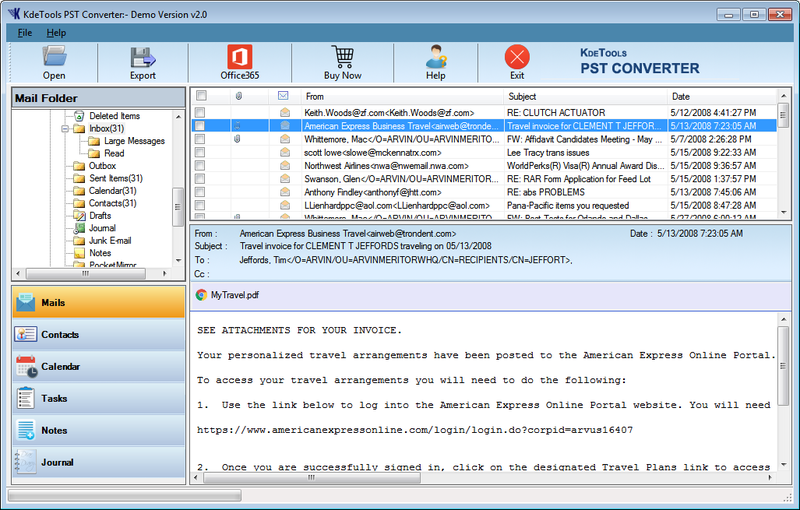 Converts Outlook PST file to MBOX for AppleMail, SeaMonkey, Thunderbird, and Opera etc. Advanced Selective Option to Select PST email items to Saved in desired folders. Exports Outlook PST file with (Inbox, Outbox, Sent Items, Draft and folders sub-folders list) etc. Convert Outlook PST mailbox to healthy PST, EML, EMLX, MBOX & MSG file format. 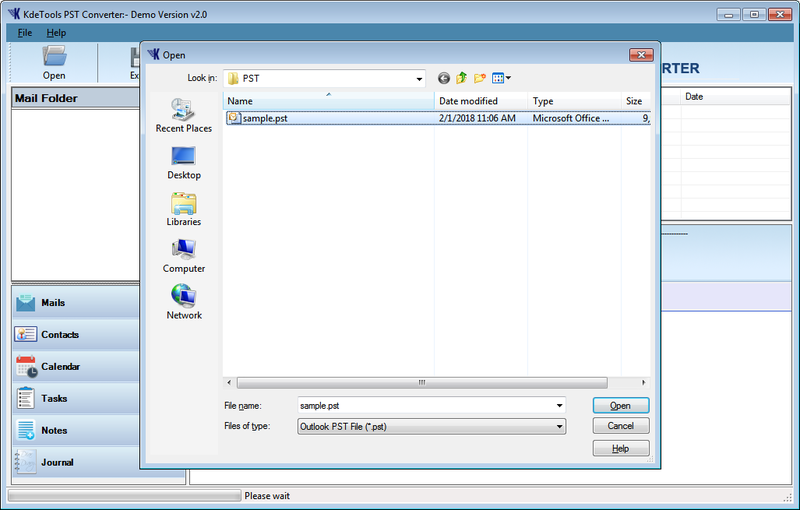 Converts the password protected or encrypted Outlook PST file to MBOX format. No file size limitation to Convert oversized PST files to other format. Supports all latest versions of Windows. 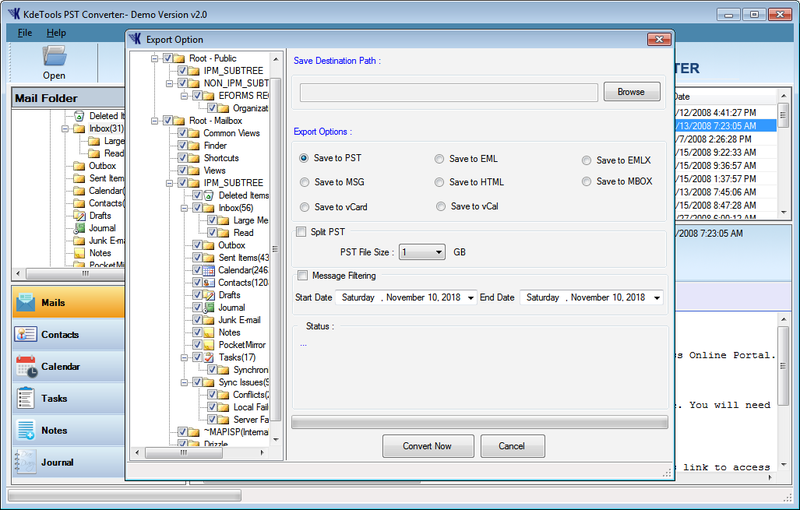 Message Filtration Options to export Outlook data between Two Specific Dates. 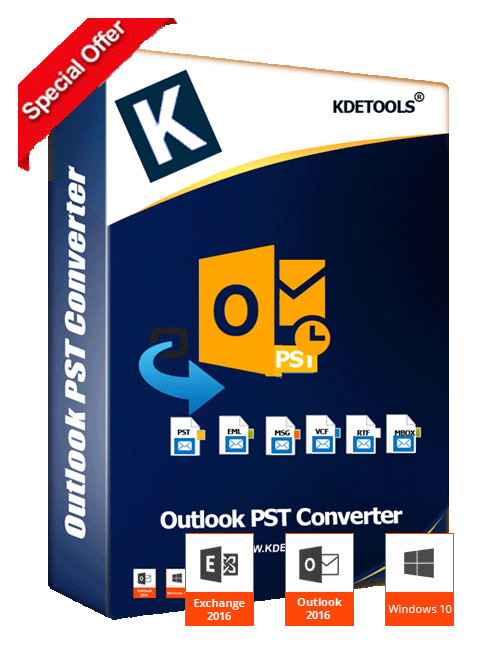 Outlook PST Converter software marking secure migration of Outlook PST file in various formats like MBOX for (thunderbird & Apple for Mac mail), PST, EML, MSG, HTML, ICS, vCard, vCal, Live Exchange server, Gmail, Lotus Notes and Office365 without installation any mail client. In digital world most of email clients are compatible with Cloud Office365 so with the help of Cloud Office365 saving option, users can easily Import/transfer their PST file into Cloud Office 365 email client with all folders, emails, attachments by login cloud account. Outlook PST Converter offers an excellent option such as 'Preview' which gives you entire preview of the Outlook PST files folders. You will seek View of the Outlook PST items such as folders, subfolders, emails, messages, address book, email attachments, deleted folders and so many more. Software maintain data hierarchy including (inbox, outbox, draft, folders and sub-folders list)etc,and also maintain while migrating Outlook PST data into MBOX Thunderbird. and after migrating data will be in original form. The PST to MBOX Converter software is absolutely easy to use because it provides the option to conversion of Outlook PST into many file formats prominently MBOX, VCF, PST, EML, EMLX, vCard, vCal, and many more. Outlook PST converter software which results in selective mail migration and scanning. After uploading a selective Outlook PST file for conversion, it scans and recovers PST items instantly and takes atleast possible time for migration of Selective Outlook PST items into MBOX, EML, MSG, EMLX file format. Our recommended software application is efficient when it is to convert bulk Outlook PST file migration. You can contact with the support team anytime in case of any sort of hurdles. Outlook PST Converter tool is supportive of Microsoft Outlook editions such as 2019, 2016, 2013, 2010, 2013, 2000 and so many more. *100% Secure - Free Trial version completely Preview of Restores Outlook PST files but Save only 30 items per folder. Step 1 : Download and Run PST converter software, then click on 'Browse Button' to load PST file. Step 2 : After load PST file, you can check PST file 'Preview' on the right side of the software. Step 3 : Then click on 'Export button' to choose required saving option. Get licensed key of Outlook PST Converter Software and perfectly export Outlook data files into different file format. Feel free to Buy HowtoSol Outlook PST converter tool because the company provides 100% customer satisfaction with 30 days money back guarantee in case of software failure. "Je suis très heureux d'utiliser cet outil de convertir PST en MBOX qui fonctionne avec succès pour convertir le fichier Outlook PST au format MBOX et l'importer facilement dans le client de messagerie Thundered... Je vais certainement proposer ce logiciel à mes partenaires commerciaux." "PST Konverter Tool kann als die beste Lösung für die einfache und sichere Konvertierung von Outlook PST-Dateien in MBOX, EML und EMLx-Format ohne Installation E-Mail-Client angesehen werden. Ich bin mir sicher, dass es ihnen auch gefallen wird, Outlook in das Thunderbird MBOX Format zu exportieren"
Copyright © HowtoSol® is a registered trademark of Ktools Software.